Summer time is travel time for most people. There's something about summer that screams vacation. But what happens when travelers, like me, run out of time off? Well, they have to plan staycations. So, fresh out of PTO, this traveler will be spending her summer in LA. But that's no punishment, I assure you. There's so much to do/see/eat/hear in LA during the summer months. Visitors and locals both benefit from the abundance of fun, outdoor activities that LA offers. Some of my readers may not know this about me: I'm a huge Harry Potter fan. 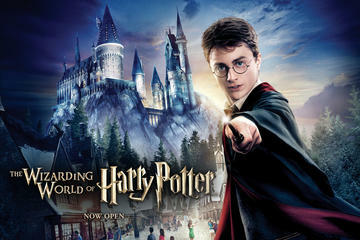 So, it seems weird that I've not been to the new Wizarding World of Harry Potter theme park at Universal Studios. Well, this is the summer of local adventure, so Harry Potter here I come! I can't wait to taste butterbeer, get my own wand, and maybe some cool Gryffindor gear. Los Angeles is the movie capital of the world, so it makes sense that many of the summer’s main attractions involve movies. And the perfect weather means that many of those movies are viewed out-of-doors in parks, beaches, and rooftops! I’ve been to many outdoor movies, usually seeing an old favorite. This summer there are even more outdoor movies to check out thanks to the growing trend. To save money, I watch sites like Groupon and Goldstar for deals on tickets for me and my friends. Summer in LA got a little sweeter this year with the introduction of Los Angeles Metro service to Santa Monica beach via the Expo Line, a light-rail train. I’m a huge fan of public transportation and will often use the Expo Line to go to events or to explore Downtown LA. Compared to other major US cities, LA’s public transportation system is lacking in many ways, but local government seems to be committed to improving the system. I’m super excited about the new service to Santa Monica and want to encourage everyone to Go Metro to the beach this summer. Summer in LA can be hot, and what better way to beat the heat than exploring a new museum. Although I've been to many of the larger museums in LA county, I've not taken advantage of the smaller, more independent museums. This summer, I'll turn to FreeMuseumDay.org for a comprehensive list free musuem days in LA county. The website also has lists of free museum days in other major US cities, so be sure to check it out! Last year I wrote about my unfulfilled desire to practice yoga on the beaches of LA. Now that I live too far away to try Beach Yoga with Brad, I'll need to find another option for outdoor yoga. I’ve been meaning to do this for a LONG time, but I’ve never quite made the time. It seems like the time is finally right! Luckily, I found this list of beach yoga classes in my new hood: Long Beach. Hopefully, I'll find the energy to crawl out of bed for an AM stretch session soon. For those of you who'll be visiting LA or who live in other areas of the city, don't miss this great list of outdoor yoga sessions throughout the LA area! Los Angeles is such an eclectic mix of people and cultures, so it makes sense that one can find just about any style cuisine you could want. Since moving here we’ve had Korean, Thai, Vietnamese, Cuban, Indian, Pakistani, Himalayan, Chinese, Japanese, Ethiopian, French, Italian, Persian, Oaxacan, Spanish and Georgian. We make a point to seek out the most authentic places and have always had great dining experiences as a result. It’s time to try something new. Perhaps I'll check out this great Ethnic Food & Culture tour from Viator! Several years ago my beau bought me the most beautiful little beach cruiser you ever did see. It’s seen some use but has mostly been parked in the garage collecting dust for the past few years. But I've got no excuse now. We recently moved closer to the beach, so it's time to air up those flat tires and ride! For those who need to rent a bike, check out this awesome beach bike rental option for exploring Venice, Santa Monica, Manhattan Beach, and beyond! We’ve been here for nearly 5 years yet there are still places in LA that I don’t know…at all. I’d love to explore Echo Park and Silver Lake more. I’d like to do a foodie tour of the South Bay (I hear there are several stellar Cajun & Creole restaurants there). I want to get to know this city inside and out! I’ll likely use my trusty LA books, online magazines, and other resources to scout out a few cool things to see and do in these neighborhoods. Los Angeles has tons of guided tours to choose from, including Old Hollywood Tours, Downtown Architecture Tours, Food Tours, and more. Since arriving here, I’ve been on several guided architecture tours. But there are several “unusual” tours that I’ve yet to try, including a cool crime tours, film noir tours, and literary tours. I love odd, eccentric, and out-there attractions and both these tour services seem to cater to the unusual. I recently had the opportunity to visit the Integratron for a sound bath...sounds pretty unusual, right? It was definitely interesting, something I'll never forget (more on that later). Years ago I bought a book called LA Bizarro. It hasn't gotten much use over the years, so I think it's time to pull it from the shelves and use it to plan a wacky girls night out! LA is famous for its vintage fashion scene. Everywhere you look, people are sporting vintage wares, young and old. It's one of the many reasons why LA feels like home to me. Over the past few years, I managed to find a few cool vintage shops in my old area, West Los Angeles. But now that we've moved to Long Beach, I've got a ton of exploring to do. For those new to the city, this guide to vintage shopping in LA is the best way to start your vintage hunts. Take a look and see for yourself! As I said before, LA is the movie capital of the world. It has no shortage of historic theaters to feed the classic movie buff's addiction. The Professor and I LOVE classic films. Our DVR is filled with movies from bygone eras. There's nothing better than settling into the seat of a cool, dark theater with popcorn in hand for a classic film, no matter what genre. There's nothing better than settling into the seat of a cool, dark theater with popcorn in hand for a classic film, no matter what genre. Here in LA, I usually go to Cinefamily or the Nuart Theatre to feed the need. But classic theaters isn't the only place to catch classic films on the big screen. Fathom Events, in partnership with Turner Classic Movies, shows select classic films in theaters across the country. I've enjoyed several showings and think you should, too! Sometimes we all need a break, not matter the reason. I’ve been pushing myself, working full-time, travel, and blogging non-stop for two years. And frankly my dear, I’m a little tired. I’m finally on a posting schedule (every Monday) that suits my schedule. Now that I've got a routine for posting, it's time to focus more on my photography and my latest passion: coaching other bloggers! I'm lucky; my new house has a great pool and spa. But for those looking for fantastic pools to lounge by, check out these fabulous hotels! If you like this post, then be sure to sign-up for my newsletter. You'll stay up-to-date on all my latest articles & partnerships, plus get a behind-the-scenes look at my blog. Sign up now to get my latest freebie! I love your idea for seeing an outdoor movie or two! It’s kind of too hot to do that in Houston, but there are drive-in movie theaters, and I’ve been dying to visit one of those! I’ll be in LA later this summer and I want to try the street art tour you mentioned – I love street art. And, all the food sounds relish too. 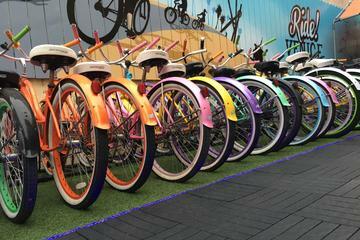 Would love to be able to bike to the beach! How convenient! I see lots of beach time in your future! Thank you so much. I’m planning to travel this fall to L.A. I will definitely go through your tips again when I know that I will be there for sure. All great ideas!!! I love that there’s light rail to the beach now. That’s fantastic! And you need to add spending a day at the Getty. Sounds like you have an amazing summer ahead of you! I love the idea of catching some outdoor movies and I’d love to hear more about weird LA! Dont think you can go wrong with outdoor movies in Summer and riding your bike to the beach. Some great ideas! One of the things I want to do in LA is go to the Getty Museum. Have you been? Yes Elizabeth! I’ve been to both Getty Museum locations many times. I was at the Getty Center just yesterday! They are both full of world-class art. I highly recommend both. A guided tour and a classic movie in a classical theatre….definitely would love these two.